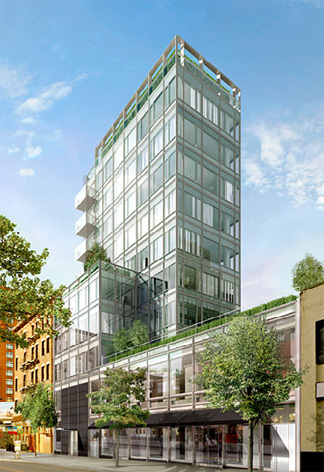 Marketing started in early 2009 for the 8-unit, 9-story residential condominium building at 350 West Broadway where the 5,912-square-foot penthouse with 1,431 square feet of exterior space is being offered for $26 million. The building is being developed by RFR, a partnership of Aby Rosen and Michael Fuchs, and it has been designed by Moed de Armas & Shannon Architects and its interiors are being designed by William T. Georgis. SLCE is the architect of record. "The language was farcical. 'Here's a good one!' she said excitedly, moving herself into an upright position in order to make the best delivery possible. 'Enwrap yourself in ultimate luxury.' She collapsed in a paroxysm of laughter. 'Enwrap! Who talks like that?'" "It must be awe-inspiring, cocoon-like, and make you feel like you're home. But above all, it must never appear to have purchased. Curated, perhaps. Edited, of course. But never shopped!" "And the reason you live with me?" he asked while refilling her glass, "You own the penthouse." The building's lobby will feature a large painting by George Condo that is reminiscent of misshapen Picasso women and Francis Baconesque faces, "Seabed," a sculptural installation by ceramicist Peter Lane, and bronze door pulls by Michele Oka Doner. The lobby will have fumed oak floors, Vermont Cold Spring Granite and lacquered wall panels. "It sees it all. The comings and goings. The early-morning dashers. The late-to-risers. The midnight scramblers, the 4 AM up-to-no-gooders, the 8 AM after-hours survivors….It takes care of its own. It can keep a secret." The building will have a 24-hour doorman, virtual concierge service, a full-time superintendent, and a fitness center. Apartments will have entry foyers, direct entry with key lock elevator, separate service entrances, laundry room, private storage on each floor, zoning lighting and shades. Kitchens will have brushed stainless steel and quartersawn American black walnut cabinetry, Bethel white granite countertops, Gaggenau cooktop, Subzero refrigerators and wine coolers and a Miele dishwasher. Baths will have Kohler cast iron six-foot baths and Steamist showers and radiant heat flooring.